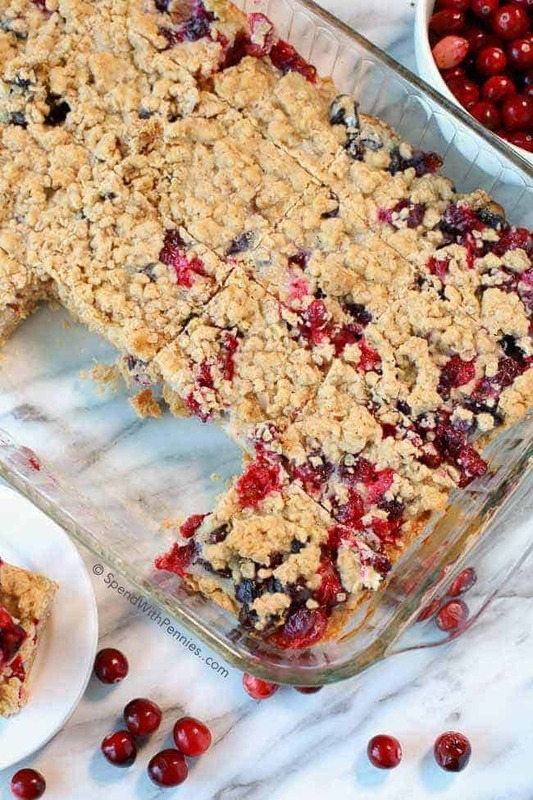 Sour Cream Cranberry Bars are the perfect recipe to make for the holiday season. 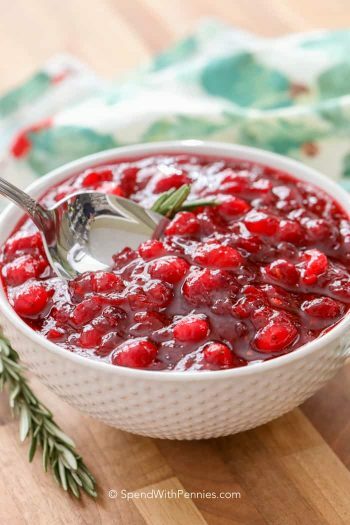 They are fruity, sweet and tart, and ideal for sharing with your friends and family to bring the flavor of cranberry season to your table. I love cranberries! They are one of my favorite things about the seasons changing and fall turning into winter! 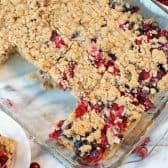 I love the tart fruity flavor they can bring to any dish, sweet or savory, and this Sour Cream Cranberry Bar recipe is no exception! 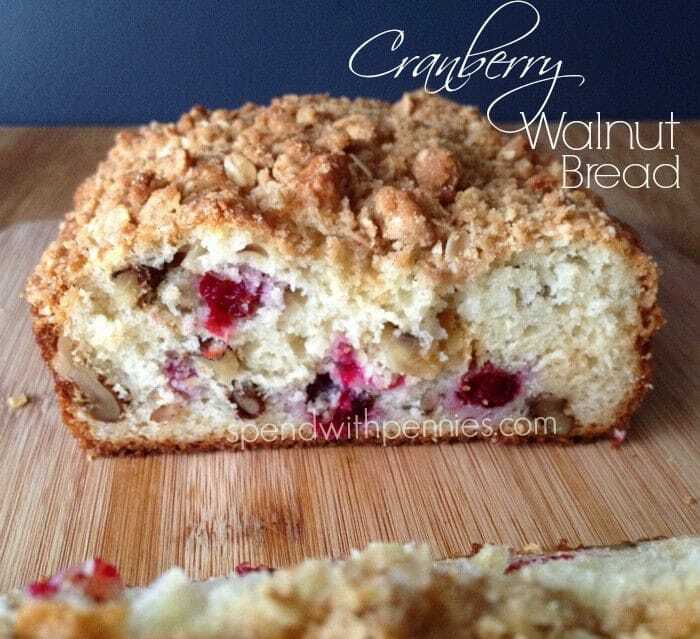 This recipe combines both dried and fresh cranberries for loads of incredible cranberry flavor. 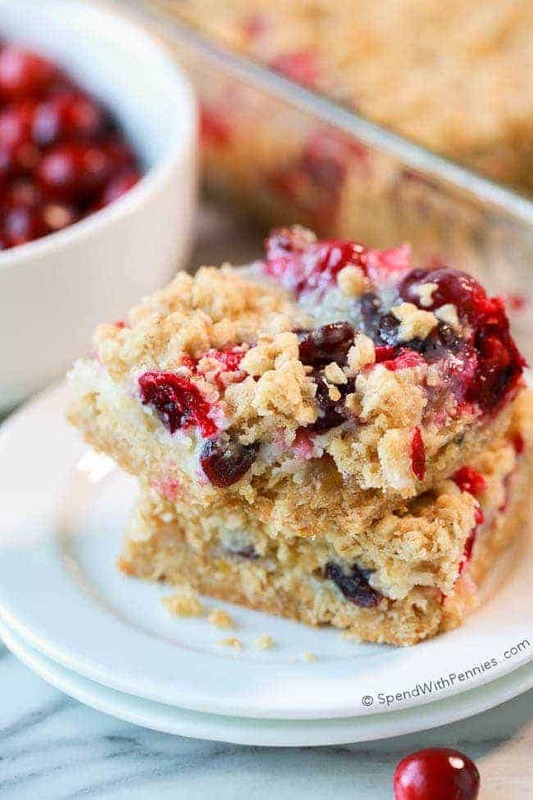 These easy bars combine a buttery crumbly oat base with the sweet and tangy texture of fresh cranberries in a creamy sour cream layer. While the base is setting up for about 10 minutes in the oven, you’ll combine the cranberries into a creamy sour cream layer. Fresh lemon juice and rind are mixed with the cranberries adding a whole new dimension of delicious (feel free to sub in orange zest if you prefer)! 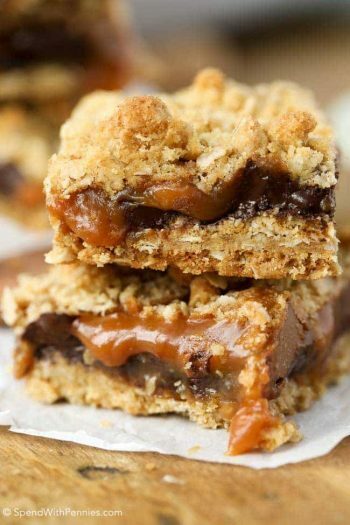 These bars are perfect with a cup of coffee and they also go great with a glass of milk for the kids. 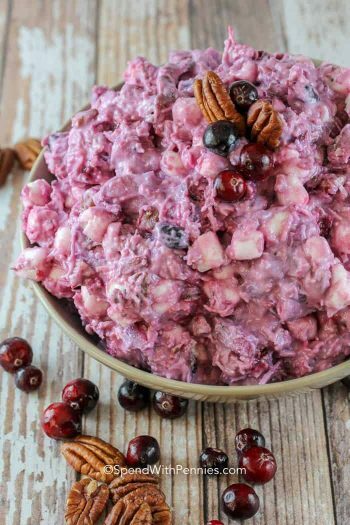 The color of the berries catch your eye and are perfect for Holiday gatherings but simple enough to make for the lunch box! Cream together butter and brown sugar. Add oats and flour and mix until well combined. Set aside 1 1/2 cups of oat mixture for topping. Press the remaining mixture into an ungreased 9x13 pan. Bake 12 minutes. Meanwhile, combine sugar, sour cream, cranberries, egg, flour, lemon zest and 2 teaspoons lemon juice in a small bowl. Spread over crust. Sprinkle with reserved topping. Bake an additional 23-26 minutes or until lightly browned. Cool completely and cut into squares. 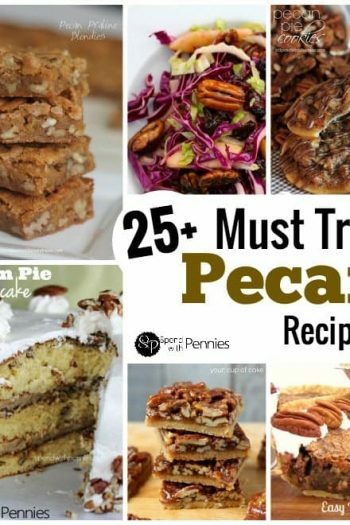 This recipe looks good, and since I’m kind of a nutty guy, we’re wondering if either almonds, pecans or walnuts would be a better added ingredient. And while giving my wife a break in the kitchen, can I substitute Splenda for the sugar? I’m thinking your Sour Cream Cranberry bars with nuts will be a perfect treat for visitors this Christmas. Thanks! I haven’t tried it with Splenda, so I can’t say for sure how it would work out. I do think the nuts would be a delicious addition, any of the choices you suggested would be delicious but I’d likely try almonds or pecans. Baked this bar today and I highly recommend it. It is very flavourful and perfect for the holiday season. You will not be disappointed. I’m new to baking so I’m not quite sure about the cranberries I bought a bag of I guess they would be fresh cranberries I guess I’ve never seen the dried cranberries so can I just use the bag of cranberries that I bought do I need to cook them first ? You do not need to cook them first. I am thinking about making this for an end of the school year gathering. Thank you. It sounds amazing. I used orange instead of the lemon. Also, be careful when you take the pan out the oven, the cranberries pop at you! I was able to make these with gluten-free flour (KAF Measure for Measure) and they came out very good. Do you think I could only use fresh cranberries, not dried? 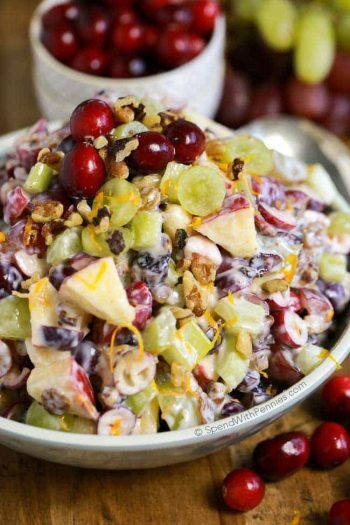 Yes it would work out just fine but may be a little more tart as the dried cranberries add a little bit of sweetness. I believe step 4 is missing the ingredient 3/4 cup sugar. It is listed with the filling but doesn’t appear in the instructions. Also, you might want to add the 2 tsp lemon juice to the filling ingredients in case the person baking is using dried lemon zest (so no lemon to squeeze). Thank you. I’ve updated the recipe. Could you replace the sour cream with yogurt? Oh baby. 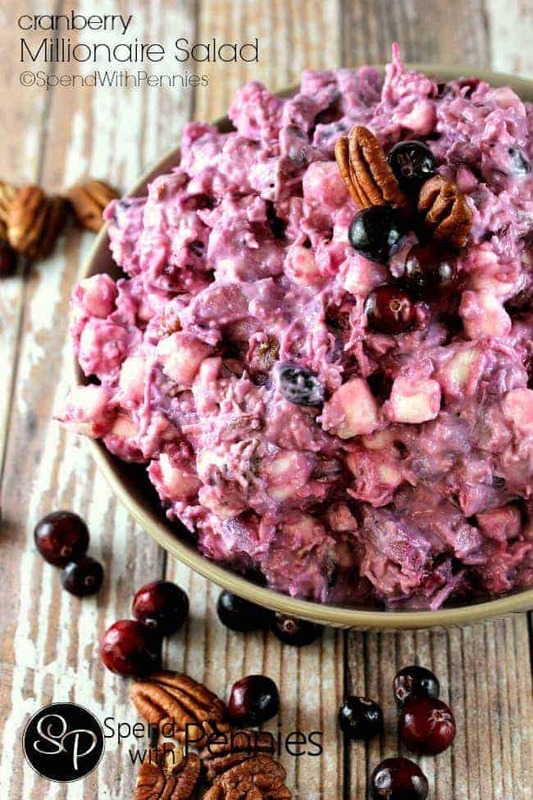 I love cranberry in sweets – it is the perfect contrast for the sugar. I particularly love how you used dried AND fresh. 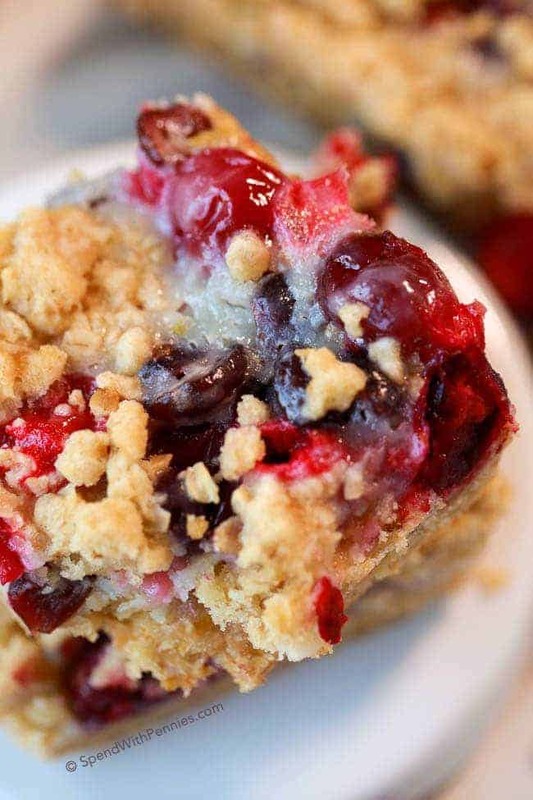 Sour cream and cranberry in bar form sounds like buttery tangy bliss to me. Thank you!! :) We love them too!